All we're hearing about nowadays is how cold it is. But we here at CT Indie were melted today by the warmth of kind words from the front person of a beautiful minimalist folk project. Thomas Nystrom happened upon our site one sleepless night, and was compelled to send a message of gratitude after finding the site "actually useful as hell". Well, thanks, man! 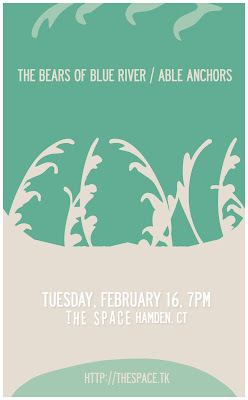 Nystrom's project Able Anchors is set to play The Space's Open Mic night on February 16th, 2010. He says that there really aren't any set members and they freely swap instruments, but the recordings on their bandcamp page belie this relaxed approach with delicate and deliberate compositions. Their three track "Paper Demo" is free for download here: CLICK. Enjoy!